Well, it’s only been 6 months or so since I last updated so it’s probably time I got around to that. Let’s see, where to start… First let’s talk about the biggest cake and cake order I ever received. It was for 17, yes 17, cakes. It was a 4 tiered square wedding cake, 12 8″ round cakes, and a half sheet to make sure people had enough cake. Believe it or not, we got it done on time and it looked pretty amazing. It was a great learning experience too because I learned just how much buttercream I can make before I never want to see any again (it’s around 40 pounds). The tiered cake was raspberry with lemonade buttercream for the bottom tier, chocolate with strawberry, vanilla with strawberry, and the top was champagne with an orange buttercream. The 12 cakes had 11 different flavors and the half sheet was chocolate marble with a chocolate mousse buttercream. I also have a new design for working in cupcakes. It’s called the cupcake dress cake. 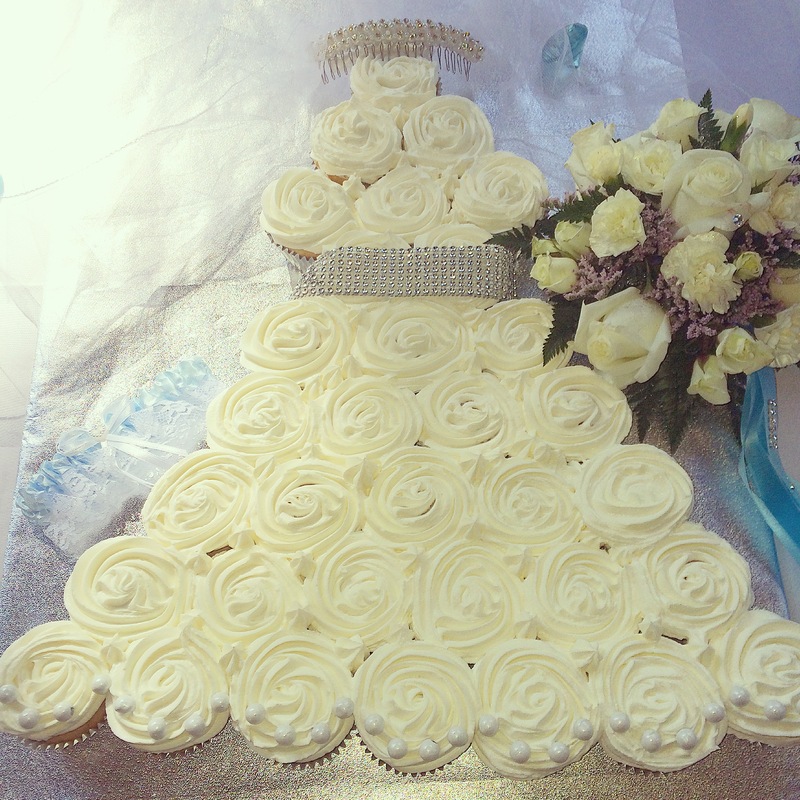 It’s 33 cupcakes arranged in a design to look like a dress. I’ve only had it ordered once for a bridal shower, but it could also be used for a princess birthday party or in place of a wedding cake. Other than that, it’s been busy around here with birthdays and the holidays plus working in the kitchen, getting new recipes and flavor combos rolling out. Hopefully, now that things are starting to calm down a bit, there will be more from me about my exciting adventures in the kitchen!